- This winter for the most part has been sub-par as far as views go and more importantly lacking good weather for long hikes above treeline. 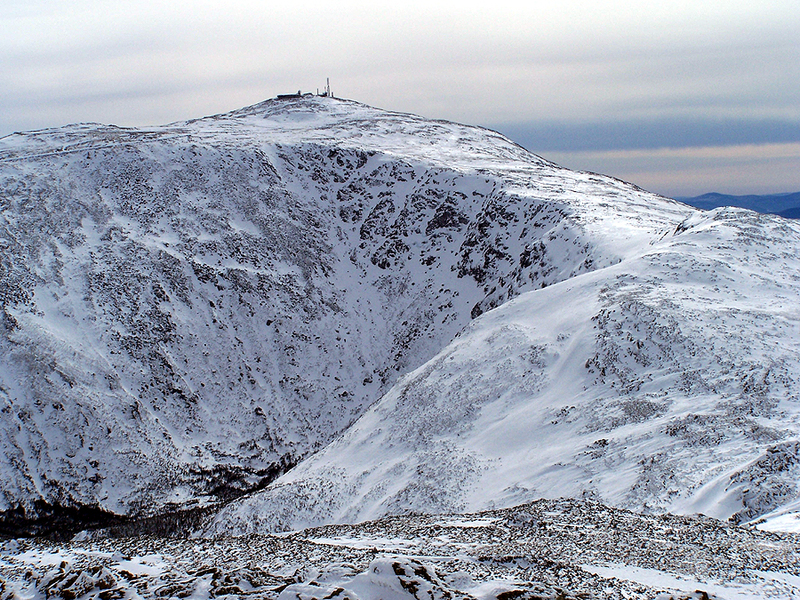 With a promising forecast of clear skies, temps in the twenty's, and wind chills around zero it seemed like a perfect opportunity to hike Mount Madison, Adams, and if the predicted high winds weren't to strong a chance to steal Jefferson. - On trail at 7am, Madison summit 9:30am, Adams summit 10:40am, Jefferson summit 11:50am, "dead ended" on Randolph Path 12:30 pm, back on Gulfside Trail 1:20pm, Madison Springs Hut 2pm, finished 3:15pm. High clouds, 100 plus miles visibility, temps in low twenty's, wind out of the southeast from 20-40 mph. 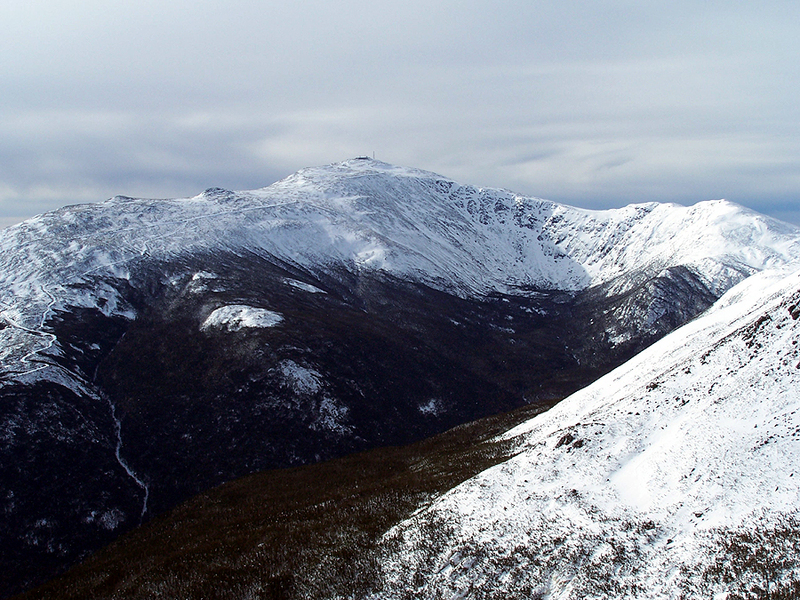 - We made good time up to Madison Springs Hut as the Valley Way was broken out and very easy to follow. As we approached treeline we could hear the wind whipping so we layered up to prepare for the biting wind and at that point it seemed like just a Madison and Adams day. - However as we climbed the summit cone of Madison the winds died down a little bit and were not bad at all. Views from the summit in every direction were incredible! - The hike up to Adams was easier than most times I remember as we were out of the wind practically until descending the summit. Conditions were good for Crampons (styrofoam snow but some rocks) from Madison Springs Hut, to Adams, down to Thunderstorm Junction. 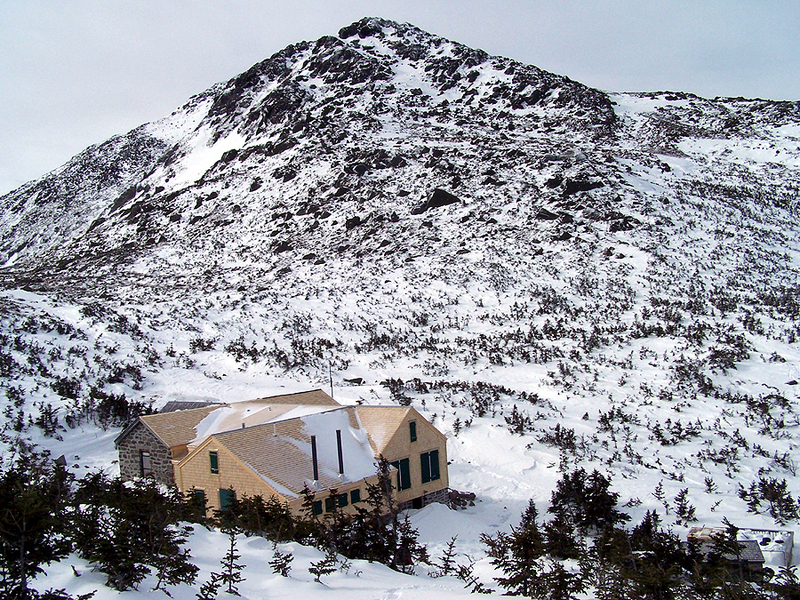 - The hike along the Gulfside Trail by Adams V peak is where the wind chilled us down as we couldn't generate enough heat while descending to stay 100% warm but once we started dropping down to Edmands Col we were shielded from the wind and heated right back up. - We decided to bypass the very steep eastern slopes on the Gulfside Trail below Mount Jefferson by going up and around and hooking back up at the Jefferson Loop Trail junction. Amazingly there was a lone hiker who was a few tenths miles ahead of us who went up the steep eastern slopes! - As we came to the summit of Mount Jefferson the winds started whipping again so at the summit we took pictures and headed strait back down to Edmands Col.
- From here we had two options, retrace our steps having to gain elevation back until hitting Thunderstorm Junction, or see if we could hike the Randolph Path and descend for good. 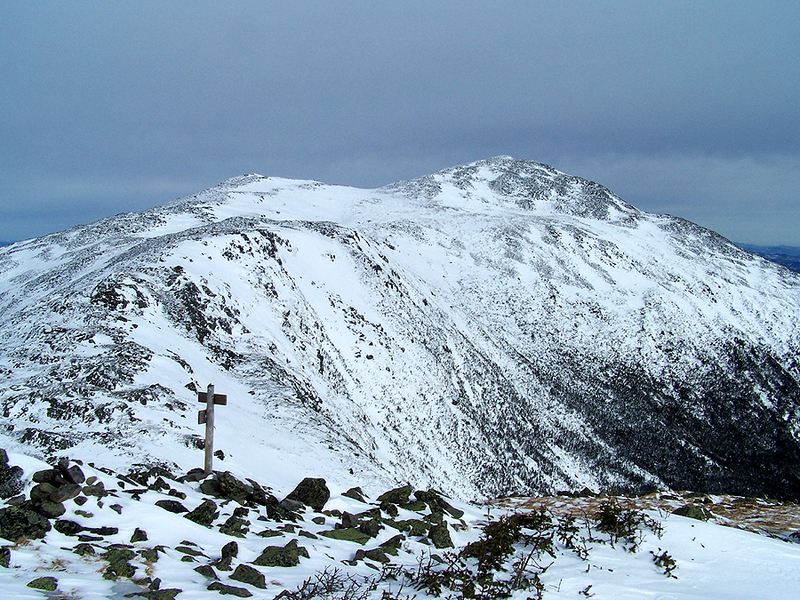 - We decided on the Randolph Path, and we followed faint tracks and were doing fine until we hit the junction for the Randolph Path and Grey Knob Trail. We stayed on the Randolph Path for maybe fifty more feet until all the cairns disappeared and we ended up going a little to high and ended up on the Grey Knob Trail. We found two cairns but it was a lost cause because I knew we were to high so we started to head towards the Randolph Path but then suddenly started to sink into a Spruce Trap field. This was the beginning of a really bad situation and I knew we had to turn around because one or two more steps and it could be dangerous spruce traps and deep deep drifts I've never encountered off trail. 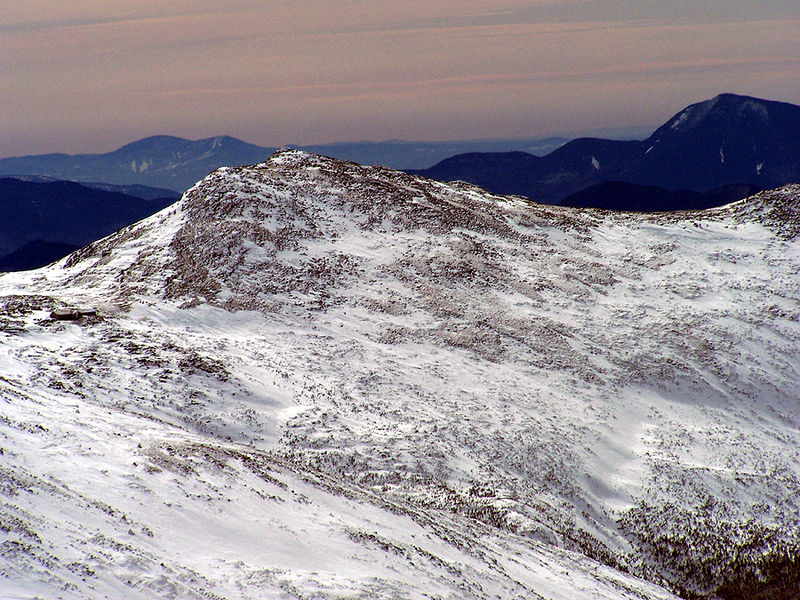 However the wind was now whipping from where we had just came and was "dusting" up some loose snow which would make for and awful trek back to Edmands Col. Looking up towards the ridge directly above us and above the Gulfside Trail on the opposite side the snow was styrofoam and knew that we could angle our way up to the ridge until gaining it then come down and hook back to the Gulfside Trail .25 mile below Thunderstorm Junction. - So we slowly climbed back up about 600 feet, it was not fun but the footing was much better and safer. Once we gained the ridge (between Storm Lake and Sam Adams we dropped back down to the Gulfside Trail and headed up a couple hundred more feet to Thunderstorm Junction. The hike on the Gulfside to Thunderstorm was pretty weird as the wind was blowing loose snow from behind us made for a cool scene if you looked back. - From Thunderstorm Junction we booked it back to the hut and went even faster down the Valley Way making it back to the car in an hour and fifteen minutes from the hut. 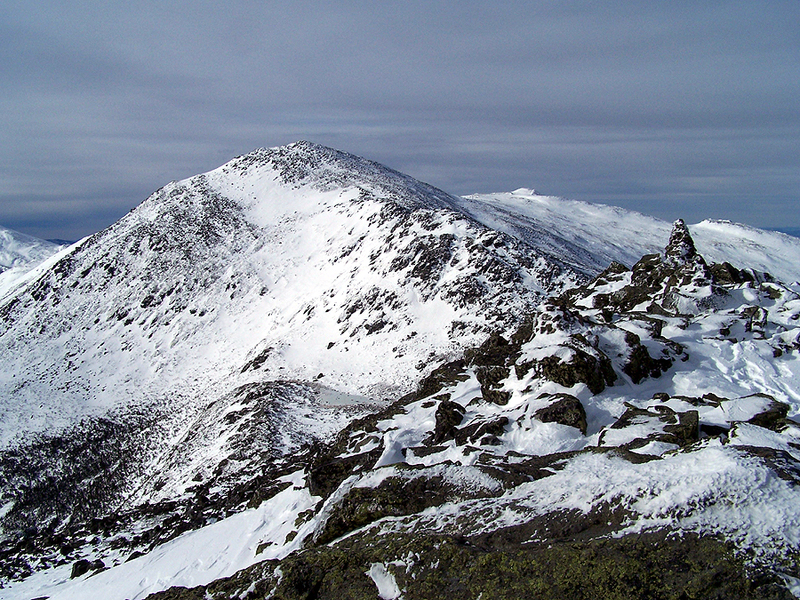 - I re-learned a valuable lesson about hiking above treeline. When planning hikes like this, make sure the weather forecast is good for the whole day and if possible the following day, bring the appropriate gear, start at first light or just after, so if you find yourself in trouble and you look at your watch it's 12:30pm (not 4pm), make sure you'll have great visibility (not socked in), and as long as you don't panic, take a deep breath, head back to a safe trail or one you are familiar with you and the person you're hiking with and responsible for because your leading the way will not become a statistic. It's me again. Nice pics and hiking as usual. 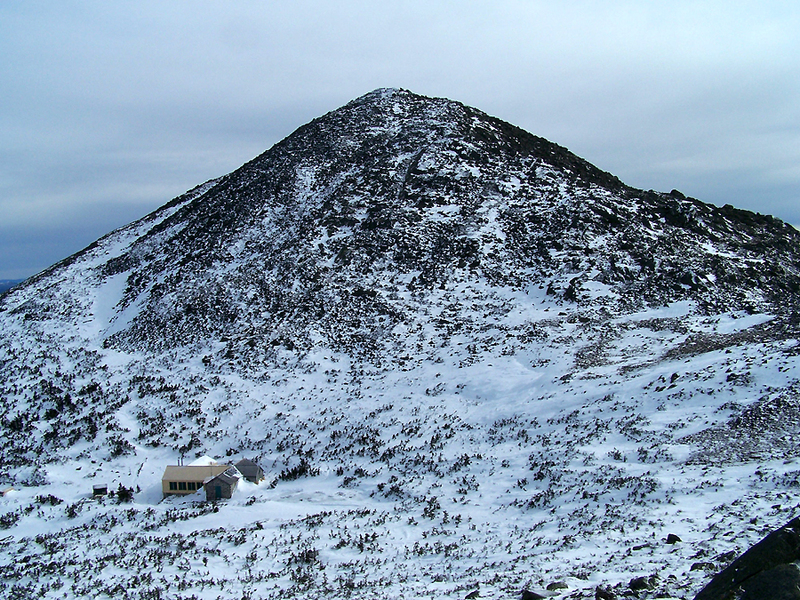 You labeled a photo, "Appalachian Trail and Mount Adams." I'm quite sure it is Madison. Can you confirm? Thanks for the response! I'm looking at your hikes again, you're are an absolute demon on the path! Thanks for posting the pics and reports. This is a tremendous resource!